Club Penguin Cheats by Mimo777 Club Penguin Cheats by Mimo777: Penguin of the Day: Fresh1403! Fresh1403 always gets so involved with Club Penguin! They always contribute to the parties by getting into character and encouraging all their buddies to do the same. Ace! Plus check out that brill hairdo...! 5,000 coins go to all POTD, so nominate you or your friends! "Plus check out that brill hairdo...!" 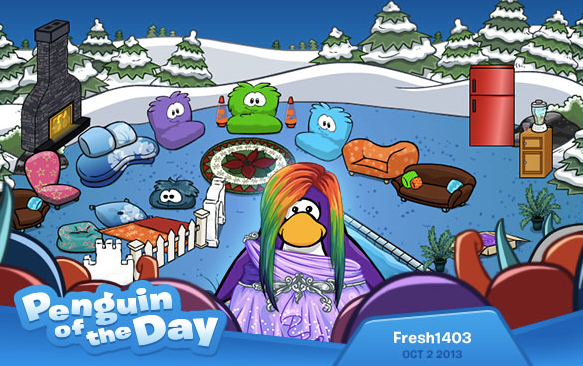 Its not that another 1,000,000 million penguins are wearing the same colorful wig.